A simple breath test, it works because each of the above conditions results from your body’s inability to absorb a dietary carbohydrate or from a condition that promotes abnormal bacterial growth in your digestive tract. These disorders create a specific chemical response that can be measured in your breath, leading to an accurate diagnosis. All three conditions listed above can cause gas and bloating, cramping, diarrhea and even nausea or vomiting in some people. These symptoms aren’t by themselves dangerous, but they can make daily life unpleasant, and if left untreated — or worse, if you have it and don’t know it — you continually place stress on your digestive system. Since the symptoms caused by these disorders are the same as from many other medical conditions, diagnosis can be difficult. The hydrogen breath test helps Dr. Khodadadian pinpoint a more accurate diagnosis. The hydrogen breath test is not a wonder drug or a new electronic gizmo; it’s simple chemistry. You don’t need any preparation for this breath test. It just measures the chemical composition of your natural breath. At this time, you also can tell Dr. Khodadadian if you’ve experienced any recent diarrhea or if you’re taking any antibiotics. Both can affect the test results. Here are some general instructions for you prior to the test. However, our office staff will give you a more detailed explanation and demonstration prior to doing the breath test. 24 hours before your test, avoid high-fiber cereals, bran, and lentils and beans. 12 hours before your test, do not eat at all and drink only water. 30 minutes before your test, refrain from smoking, sleeping or exercising. The hydrogen breath test measures the amount of hydrogen in your breath after drinking a solution designed to test for a specific condition — mild for lactose intolerance, for example. Normally, your breath contains no detectable hydrogen, but the chemical reaction in your digestive tract from the beverage you consumed creates hydrogen if the test is positive. After you drink your beverage, you arrive at Dr. Khodadadian’s office for the test. At regular intervals, you breathe into a device that collects your exhaled breath and analyzes it. It’s that simple. The doctor will review the results of the test before you leave the office. Note that certain foods and medications, as well as smoking, can skew test results, so it’s important that you avoid them the day before the test. See the list above. You will have no special needs after the test. You can resume eating, drinking and smoking (if necessary) after the test has concluded. 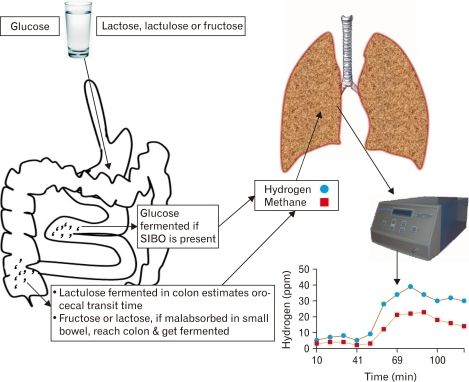 There are no side effects or complications from the hydrogen breath test, except now you will know for certain whether you are lactose intolerant, fructose intolerant or suffer from SIBO. Important Reminder: This information is only intended to provide guidance, not definitive medical advice. Please consult a doctor about your specific condition. Only a trained, experienced board certified GI doctor like Dr. Khodadadian can determine an accurate diagnosis and proper treatment. For more information about the GI conditions we treat or to schedule a consultation with the GI doctor, Dr. Shawn Khodadadian, please contact our NYC office. We offer the most comprehensive hydrogen breath tests in NYC.